The company's new Shanghai Reserve Roastery is its second – and biggest – in the world. 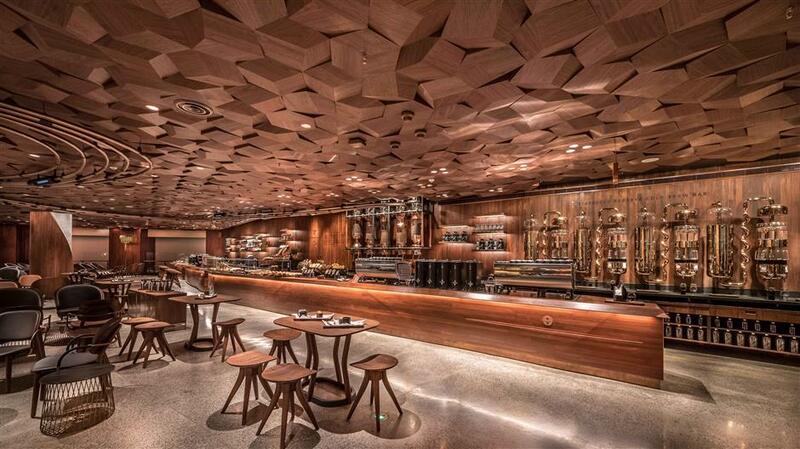 The new Starbucks Reserve Roastery in Shanghai boasts the longest coffee bar in the world. The cafe — one of thousands of trendy, artisan coffee shops in the city — reflects a growing cafe culture in China that’s driving growth for chains like Starbucks Corp and attracting more competition. Starbucks dominates in China and is growing fast in the market, while in the United States it comes under pressure from a “third wave” of boutique coffee sellers and cheaper rivals. Executive chairman Howard Schultz, speaking at the launch of Starbucks’ first overseas “Reserve Roastery” — an opulent flagship store with gourmet coffees and a bakery — said China was on track to be “bigger, more powerful and more significant” than the firm’s US business. “With the rising middle class and the opportunity in China, the market is going to be much larger here,” he said, adding Starbucks was looking to hit 10,000 outlets in China within a decade, catching up with the United States in terms of stores. The firm held a 54.8 percent share of China’s 25.2 billion yuan (US$3.81 billion) specialist coffee shop market last year, far ahead of rivals like McDonald’s Corp’s McCafe and Whitbread Plc’s Costa Coffee, Euromonitor data show. Unlike in the United States, Starbucks’ challenge in China has been winning over traditional tea drinkers to coffee, rather than fending off local rivals. That could be changing. “Right now we notice an increasing number of small brands and independent coffee shops. They are registering explosive growth rates,” said Shanghai-based Euromonitor analyst Yu Limin. Shanghai alone has an estimated 6,500 coffee houses, with small chains, independent stores and bakeries battling for a slice of a market that Mintel says could grow to 79 billion yuan by 2022 from 60 billion yuan this year. Convenience stores, which already offer hot food popular with breakfast crowds, are also rolling out coffee. “There are a lot of new players and the cake is getting bigger,” said Lawrence Ge, founder of Single Patch Coffee, who runs coffee workshops and cafes in Shanghai and Suzhou. International coffee chains are now looking to get in on the act, too — despite Starbucks having a big head start. Peet’s Coffee, a craft chain that rivals Starbucks at home, opened its first China store last month, and has brought in local help from investment firm Hillhouse Capital and Sam Su, ex-China head of Yum Brands Inc, who drove impressive growth for KFC and Pizza Hut in China. “China is top of my priorities for 2018,” Pascal Heritier, chief operating officer of Italian coffee company Massimo Zanetti, told Reuters, adding the firm, which sells Boncafe and Segafredo coffee, was in talks with local partners about expanding its presence. Starbucks itself is doubling down on China, where in the latest quarter it saw 8 percent same-store sales growth and said it would buy out its joint venture partner in east China for US$1.3 billion. As well as its new Shanghai coffee “roastery”, Starbucks has rolled out higher-end coffee bars in China, is looking to improve its food offering, and has leveraged popular mobile payment platforms from Alibaba Group Holding Ltd and Tencent Holdings Ltd.
That premium push may be too late to win back consumers like Zhou Hanwen, a market analyst in Shanghai who says she’s a “serious coffee user”, but has switched from Starbucks’ lattes to smaller, trendy coffee houses. “I like quieter venues and so usually go to rather arty, yuppie places,” she said, while sipping a brew at downtown Mellower Coffee, which has coffees with names like “sweet little rain” — an Americano with a “cloud” of candyfloss. Zhou added she also now more often makes coffee at home — another trend analysts say is challenging physical stores. For now at least, China’s developing cafe culture is likely to be more a boost than burden for big names like Starbucks.